Over the past couple of weeks I’ve been cautiously eating bits and pieces of gluten, but this week it was time to go big. It was time for Real Bread. Something I haven’t eaten in almost five years. Step one was the construction of the sandwich. It was odd to hold gluten bread in my hands, to cut into it with a knife and not fear the contamination that the spreading crumbs might cause. 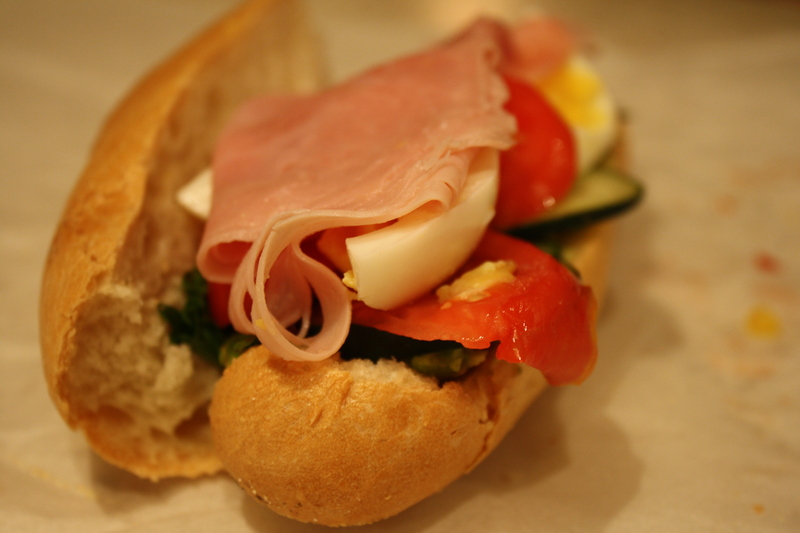 This was followed by the photographing of the sandwich, to immortalize it in memory forever on this blog. And then came the eating of the sandwich. My girlfriend sat beside me at the counter as I ate, and I couldn’t help blurting out the obvious. Her: Yes, that’s gluten for you. Me: Yeah, but it’s really, really chewy! And then my senses moved beyond texture, and was transported into a place of involuntary memory. The taste, the smell of the bread evoked Tesco’s, Quinnsworth, Irish supermarkets I hadn’t shopped at in years. I could see the bread aisle, the baskets of baguettes and fresh baked breads. I narrated these inner images to my girlfriend as they came up. Me: Supermarkets in Dublin! And my old flat on Leeson St! Her: You’re having a Proustian moment. Like with the madeleine. Proust wrote in The Remembrance of Things Past about eating a madeleine cake, the smell and taste of it evoking memories that had been locked away for years. Smell is the sense most strongly linked to memory, and the bread was unlocking images associated with gluten that I hadn’t thought about in years. Me: What else do we have in the house? What else can I remember? We opened up all the cupboards, and hit the jackpot with a box of Cheerios. 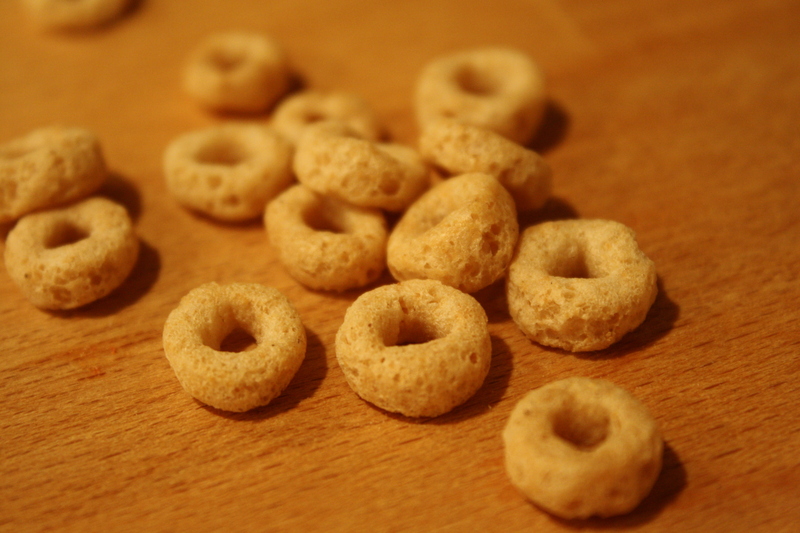 I ate a handful and was flooded with memory of being a Montessori teacher, the activity where the kids worked on their fine motor skills by threading Cheerios onto floss to make necklaces. And more, being a babysitter, feeding breakfast to little Nathaniel, carrying a ziploc bag of Cheerios to the park for a snack. I have been through the process of being a real immigrant, moving from Ireland to New York in my 20s and losing all of the environmental cues to memory that being away from your native land entails. I keep thinking now that being gluten free is like being a food immigrant. Moving to a different culinary land without even leaving home. And then of course, when the immigrant returns, the memories are all there, ready to flood the mind’s eye at every turn. So back to the actual point of all this. How did eating the sandwich turn out? Any symptoms? Nope. I woke up the next morning and I couldn’t feel any neuropathy, no twinges, nothing strange. I’m ready to move on to the next experiment: a week of daily gluten consumption. My girlfriend is already planning a menu of yummy gluten dishes she hasn’t been able to serve me in years. I can’t wait. I read your book and visit your website from time to time. You are giving me hope. I am just about to begin oral chelation….after a long road already. Thank you! Good luck Jo! I hope everything goes very smoothly for you! How does mercury toxicity cause gluten intolerance? I don’t understand. I’m super happy for you, but I can’t wrap my head around the possibility of gluten intolerance being connected to something like heavy metals, that could possibly be healed. My reaction to gluten is extreme (suicidal, rage, psychosis, anxiety, joint pain, IBS, paranoia). Secondly, I question why glutenous things would still taste good if you’re no longer allergic, I am under the impression that it is the peptide opoids in gluten that make it addictive and opiate-like. Isn’t that something that can’t be taken care of by mercury detoxification and is a part of the overall problem that is gluten intolerance? So confused. If you harbor any knowledge as to this I would greatly appreciate it. 1. Mercury specifically poisons the adrenal glands, and their job is to produce cortisol, which reduces inflammation all over the body. When cortisol is low, inflammation and allergies flare up. 2. Mercury disrupts the balance of intestinal flora in the gut, leading to leaky gut, which some say allow large molecules to pass into the bloodstream that shouldn’t be there. Gluten is one of those molecules. 3. Mercury interferes with the delicate balance of the immune system, leading to autoimmunity, which is how many people experience gluten symptoms ie Celiac Disease. I don’t know much about the gluten addiction issue. I take great pleasure in eating many foods that are not addictive like delicata squashes (are they addictive? They’re so yummy, maybe they are!) I think my delight at eating gluten again is a result of my newfound freedom from restriction, not because it is addictive, but who am I to say?